J.M. Joosten, Piet Mondrian, New York, 1998, vol. II (Catalogue Raisonn of the Work of 1911-1944), p. 486, no. C83 (illustrated). In 1920 Mondrian, who had a studio on the rue des Dpart in Paris, wrote a pamphlet in French titled Neo-Plasticism in order to explain the goals of the Dutch Die Stijl movement. The abstract grid had become the foundation of his pictorial style. Unfortunately, Mondrian's collectors were unwilling to follow the artist into the austere and rarified environment of Neo-Plasticism, and without sales Mondrian suffered from an acute lack of income in the early 1920s. An exhibition of new work at Lonce Rosenberg's Galerie L'Effort Modern in 1923 was a failure. However, the dealer Simon Maris continued to sell the artist's early naturalistic works in Holland. Interest in them grew, and there was a strong demand for his studies of flowers. Mondrian began to paint more flowers in 1920, which his friends could sell for 30 or 40 florins apiece. He stopped painting them in 1925. Ironically, those who remember his Paris studio say he kept no flowers apart from a single artificial tulip in a round vase. Although the treatment in the flower studies is naturalistic, these works retain strong overtones of symbolism. 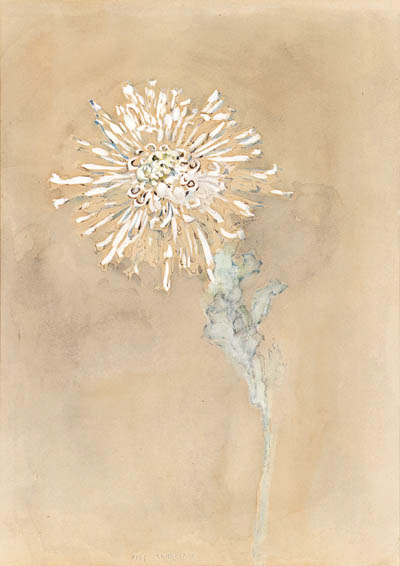 "It has been suggested that Mondriaan's use of the chrysanthemum symbolically refers to human mortality as found in the literary symbolist tradition of Western Europe, for example in Maeterlinck. Its use by Mondriaan in connection with the festive celebration of the young Queen's marriage [in Moeterlinck's drama Pellas et Mlisand] however, testifies that Mondriaan could just as easily have meant to suggest overtones of life-giving vitality. Into it could be read a symbolism of moral uprightness, royal dignity and sturdiness, in Far-Eastern countries associated with this eastern type of chrysanthemum." (R. Welsh, B. Bakkers and M. Bax, 1892/1912 Piet Mondriaan: The Amsterdam Years, exh. cat., Gemeentearchief, Amsterdam, 1994, p, 110).